The attractive Hertfordshire town of Ware, as far as I can ascertain, has had two notable residents. Sadly no longer with us, Brian Wilde who played Foggy Dewhurst in Last of the Summer Wine lived in the town prior to his death in 2008, which occurred almost ten years ago to this day. My old man was nicknamed ‘Foggy’ back in the day by some Belper Town fans during his time with the club, and the mention of his name always raises a smile! Did Wilde ever trot up to watch the football, who knows? Very much currently with us is Richie Firth, a DJ on Absolute Radio and all round funny bloke who I do enjoy listening to. It’s through listening to Firth that I feel I know Ware, his seemingly daily trials and tribulations more often than not involve some form of retail establishment, DIY store or eaterie in and around the locality. Firth, to the best of my knowledge, has never mentioned Ware Football Club during the course of his shows, although he does mention Arsenal fairly regularly being a season ticket holder. However, the stadium at Wodson Park, just off the A10, does not appear to be one of his regular haunts, unlike Wickes or IKEA for example. Getting to watch Ware has been something of a challenge for me this season. I’ve been planning on going since January but put simply, rain, frost and snow over the course of the last two months has meant it’s simply never happened. But, the recent ‘Beast From The East’ does appear to have signalled the move from Winter to Spring and as temperatures soared, snow disappeared and all in the World started to look good again, we had a fit pitch, a good forecast and a journey South to make. 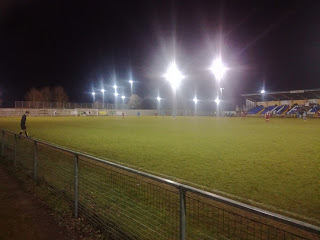 The journey to Ware took me down the A1, via Baldock and Buntingford, before eventually joining the A10 and arriving at the ground which sits on the very outskirts of the town. It was while driving down the A1 that I began to wonder…. If ‘Lorry A’ travels at 59.9 mph, but ‘Lorry B’ travels at 60.1 mph, how long does it take one to overtake the other? The answer is simple, pretty much all the way from Grantham to Stamford, that’s how long if fricking well takes! Digression and indeed frustration aside, the Wodson Park home of Ware Football Club is a relatively new complex built, as I said, just off the A10 on the North side of the town. 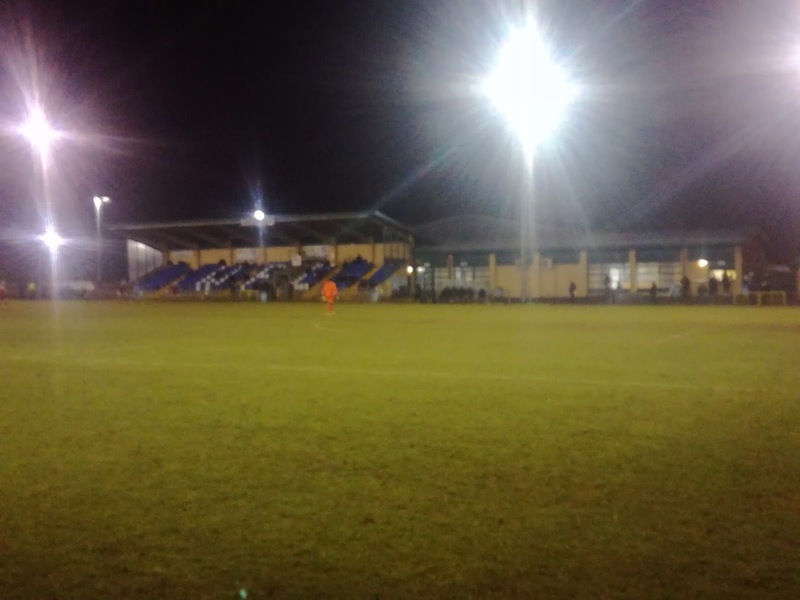 The complex incorporates a Leisure Centre and a running track, which itself is the home of Wodson Park Football Club who play in the Spartan South Midlands League. The football ground itself is a nicely appointed venue, with a good sized main stand on one side, and a covered terrace opposite. 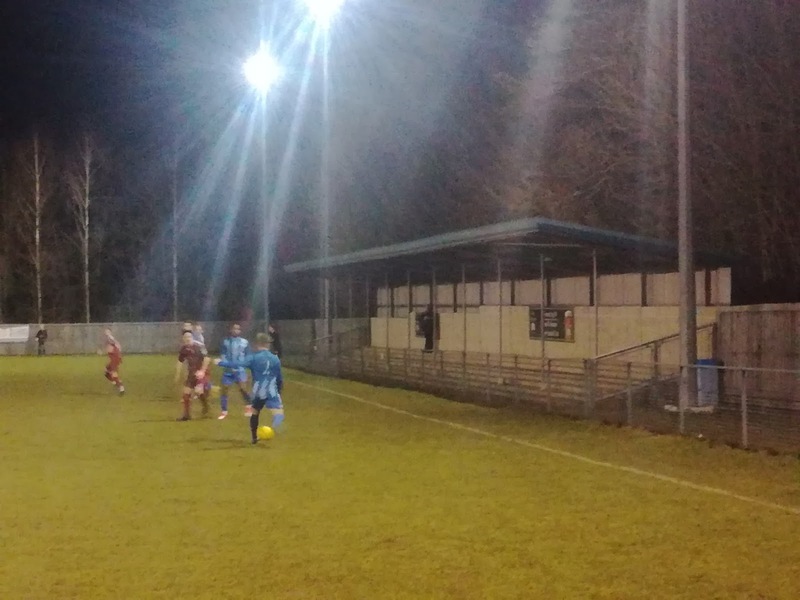 Behind both goals are very small areas of stepped terracing that are uncovered, while the clubhouse and dressing rooms sit to the side and the rear of the main stand. 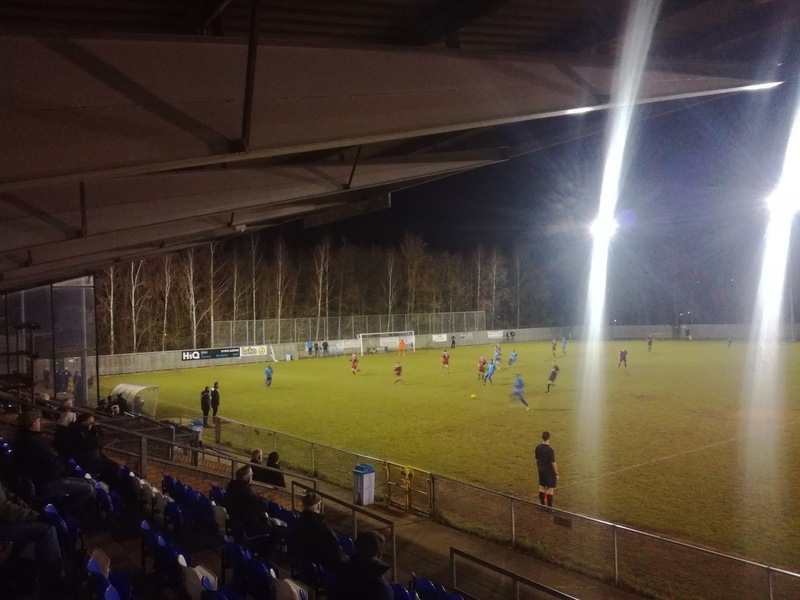 An Isthmian League side since the mid-Seventies (bar one season in the Southern League), the club have moved between the divisions until winning the old Second Division in 2006 and taking up a place in the First Division North. Recent seasons have been something of struggle with third bottom finish last season, while this season they sit second bottom. The weather has clearly not helped them as they now have to play twice a week until the end of the season, like many clubs have to, plus added to the equation they are now on the third Manager this campaign, it’s been a tough old time for the club. Relegation would appear to be unlikely though, Romford look set for that, and with a number of home games still to play, I expect Ware will do enough to pull clear of any danger. Visiting Brentwood Town sat just above them in the table and on the night they ran out 2-0 winners thanks to a goal in each half. Ware had some skilful players and plenty of the ball, but struggled to get anything particularly meaningful on target. The visitors, when they had the chances, they put them away. It was an entertaining and well fought spectacle, which especially in the second period, got a bit disjointed with substitutions and a referee that got somewhat whistle happy. A frustrating night for Ware though as I suspect this was a game they earmarked as one where they felt they had a chance of taking the points, but it was not to be. Ware are a very friendly club, and this was no more apparent than when I did what I usually do when visiting a club away from my home manor. I try and help the lads out who run the Club Shop at Alfreton Town by getting them some old programmes if clubs have spares. 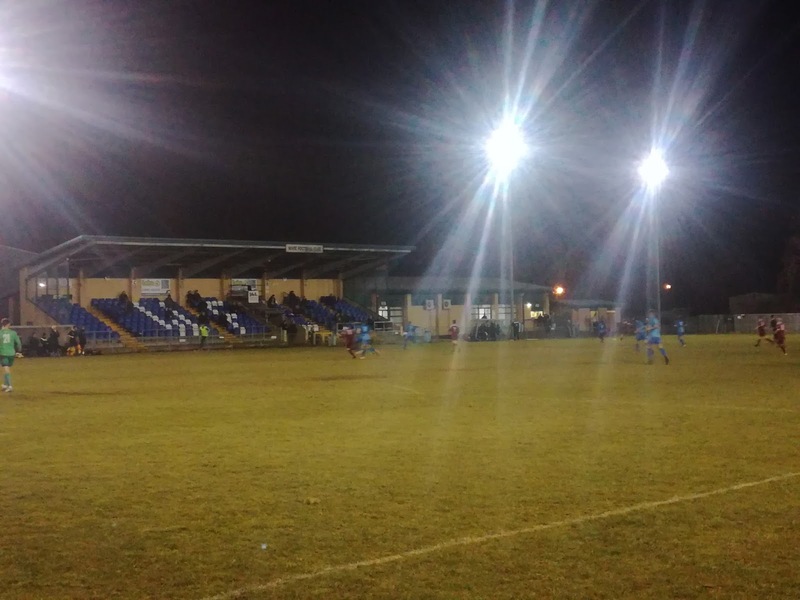 I approached Club Secretary Bill Spink at half time and he duly obliged with a pile, and had a genuine interest in why I’d chosen to visit his club. I know how busy Secretaries are on the match days so it was great of him to take the time and chat. The journey back was a pain in the rear to be honest. The M1 was closed at junctions 18, 22 and 24, but I guess in recent weeks I’ve dropped lucky and avoided any closures, so at some point I was always going to suffer, and to be fair it added only around thirty minutes onto my journey, which meant I arrived home just before 12.30am. Just 60 spectators attended the game, of a town with a population of just over 18,000. I think Mr Firth should give them some publicity on national radio to drum up some additional support. Maybe even give it a go himself, that way he wouldn’t have to keep dragging his ‘Wenger Out’ placard to football matches! It’s only a brief detour from Wickes…..